The Philadelphia Story: Rising up, or stepping down? For most students of film, the name Fritz Lang is inextricably linked to his 1927 German Expressionist, dystopic epic Metropolis. The fixation on Metropolis is not without some merit. It is a stunning visual landmark that towers over the silent era and casts an inescapable shadow over every “vision of the future” film that follows. Yet, Fritz Lang made over forty films in his long career as a director, a career that spanned three eras of filmmaking: the silent era of German Expressionism, Weimar cinema, and classic Hollywood cinema. He was one of the originators of Film Noir and a prolific contributor to the genre with these noir-inflected films and classic noirs: Dr. Mabuse, der Spieler (1922), M (1931), Das Testament des Dr. Mabuse (1933), You Only Live Once (1937), The Woman in the Window (1944), Scarlet Street (1945) Secret beyond the Door… (1948), The Big Heat (1953), The Blue Gardenia (1953), While the City Sleeps (1956), and Beyond a Reasonable Doubt (1956). This essay will focus on M and Scarlet Street, the former being an incalculable influence on Film Noir and the latter a concrete example of Lang’s mature noir style. If any film were to be considered the bridge between German Expressionism and Film Noir, it would be M, Lang’s surprisingly modern crime thriller about a child serial killer on the loose in Berlin. 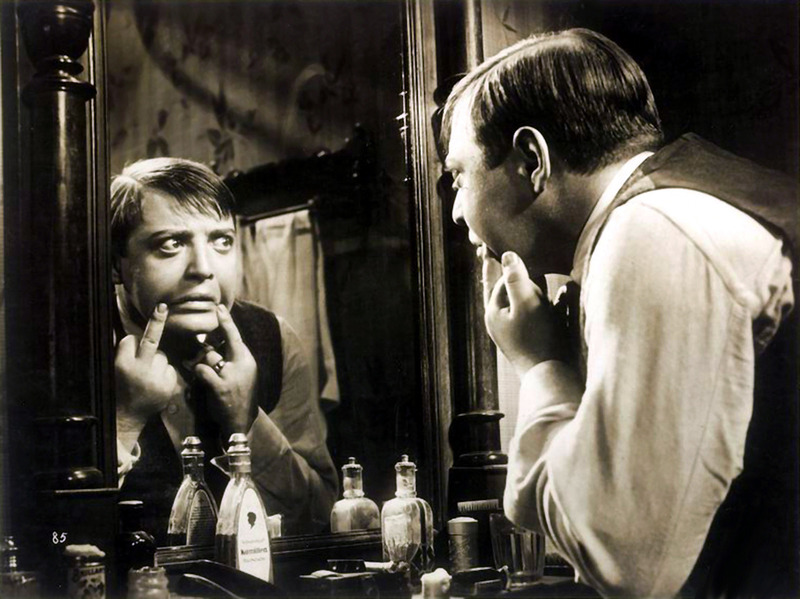 M is also the bridge between silent and sound film, at least in the context of German film history. Lang’s use of sound is innovative and dynamic: “Lang was the first to realize that, unlike the theatre, the sound film did not have to limit itself to a straight-forward narrative of events.” (Eisner 321) For instance, as the police chief describes the difficulties of the manhunt, we see the images pursuant to his descriptions. This may be considered a primitive ancestor of the first-person narrative technique that evolved and reached its apogee in the works of Wilder. Here is an even more shocking example. We hear the voice of Elsie’s mother crying out in vain for her daughter, the shots of empty spaces illustrating Elsie’s disappearance. Finally, in a brief series of shocking images, Elsie’s ball rolls from behind a bush, and then we see an anthropomorphic balloon trapped in telegraph wires. 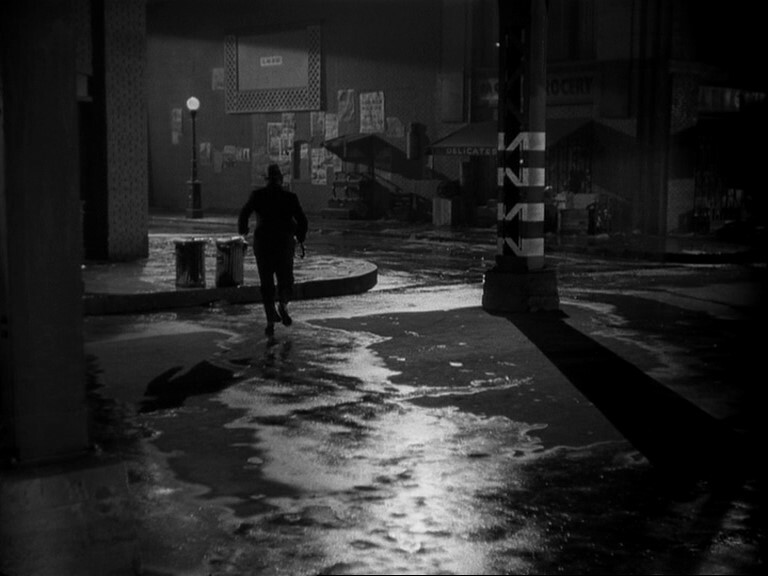 The work of Fritz Lang, especially Scarlett Street, bears some similarity to the work of Billy Wilder, his fellow émigré. As Hillier and Phillips describe Scarlet Street, “As an American film noir directed by a prominent European exile, like Double Indemnity (1944), it brings a skeptical and satirical eye to the foibles of a central protagonist at sea in the serial modernity of America’s advanced urban capitalism.” (Hillier and Phillips 230) Materialism, greed, and the modern world—all these meet in the central image of noir, the city. The city of Scarlet Street is no more congenial than M’s Berlin. It is harsh, dangerous, duplicitous, and unforgiving. Chris meets Kitty in the street. He believes he saves her from an attack by some loathsome creature of the night—in reality, it is her lover and pimp Johnny. Chris imagines himself the valiant defender of innocent maidenhood against the cruelty and licentiousness of the city. As it turns out, Kitty is merely an extension or representation of the city’s inhumanity, and it is her indecent, impure lust for Johnny that motivates much of her awful behavior towards Chris. In M and Scarlett Street, Fritz Lang offers two of the darkest, most disturbing, and most cynical glimpses into the human psyche played out on the stage of the dark and forbidding city. Lang presents us the picture of a bleak world whose cinematic representation is truly deserving of the moniker Film Noir. Welcome to the site of the virtual Museum of Film History, to be curated by the students of ENG 3122-048A: Film History II 1930-1965, Spring 2012 at the University of Florida.